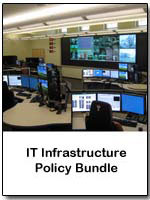 Individual Policy Templates - Managing the activities of end-users with today's tech-savvy workforce is a huge challenge. The temptation is always there for employees to abuse social networking sites, instant-messaging, telecommuting privileges and install personal software on company equipment. Lost productivity, slow service, viruses and worse are inevitable unless you are able to develop and enforce clear IT policies throughout your company. Sure, you have rules for using technology. But are you continually encountering gray areas? Do you have people in your company who like to "push the envelope" with their computer privileges? Do you find that you and your company just spend way too much time defining rules? All of the policies that are provided here are contained within one or more of the templates that are on this site. These policies have been added as individual documents in MS WORD format for those clients who just need this particular policy. 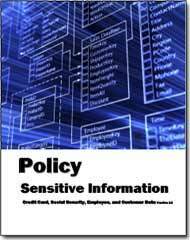 All policies are Sarbanes-Oxley, HIPAA, PCI-DSS, and ISO compliant. Option are purchase the full set or just those that you need. With the advent of blogs, there is a need to set rules of the road for the use of blogs by employees, contractors, agents, supplies and others. This 8 page sample blog policy contains specific policy statements on what can and can not be done via blogs. There are 13 specific guidelines defined as specific guidelines for personal web sites and blogs which are on your enterprise's domains and those on are on domains outside of your enterprise's control. The policy template comes in word format and can easily be modified to meet the specific requirements of any size enterprise. To survive an incident such as a business interruption, security breach, or a product recall, organizations need more than a successful communication strategy - they need an incident communication plan. 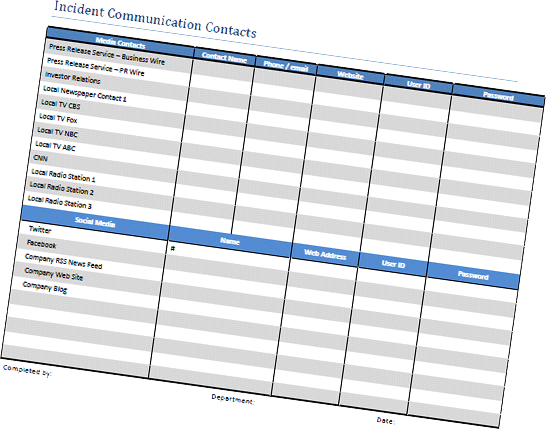 The overall objectives of a incident communications plan should be established at the outset. The objectives should be agreed upon, well understood, and publicized. For example, will the primary objective of the communications plan be for communications only to employees, and only during a disaster? Or is the intent to advise customers of interruptions to service? Or is it for investors and stockholders? Or regulatory agencies? Or is it some combination of these? Whatever the objectives of the enterprise, they should be shared, supported by executive management, and widely communicated - both via traditional media contact and social networks. This policy template addresses those needs directly as well as provides electronic tools that aid in the execution of of the policy. Driving electronic communication is the fact that data is easier to find when it is a click away than when it is stacked in folders. E-mail is a great source of easy-to-access information. When faxes and paper communication are integrated into the email automation framework, there is little fear of losing them. Organizations that have or want to establish a company wide telecommuting program should establish a formal, written telecommuting policy document that is regularly reviewed and updated by IT, human resources, legal, and finance. This will ensure that managers and the corporate services and technical support groups within the organization are aware of their respective role and responsibilities for enabling and supporting telecommuting. It also will help ensure that telecommuting employees know about their responsibilities too, along with new company and approved third-party applications and support services available outside company facilities. 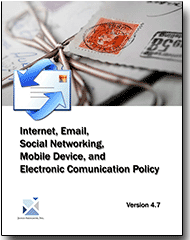 Businesses have to comply with industry-specific regulations for digital communications. This is a bigger challenge for multinational companies, where regulations vary from country to country. How can companies comply with these regulations without sacrificing business velocity and driving up costs? The answer lies in adopting standardized email policies that include best practice work flows to enforce compliance with industry-specific rules for process and content. This serves the dual purpose of keeping businesses out of trouble and providing superior customer experience. Best Practices for commercial Email are defined with compliance to CAN-SPAM Act as its focus. All companies archive e-mail whether they realize it or not. Merely backing up an e-mail server creates an archive. The real question is what policies your company should have regarding those archives. What messages should be archived, for how long, and who should be able to access them? Depending on your requirements, which may or may not involve regulatory compliance, you can determine whether you need a separate e-mail archiving solution, and if so, what features it should have. In some cases, the features built into e-mail servers, which include e-mail retention policies and basic e-discovery capabilities, may be sufficient. In others, you may need to pay for a full-featured archiving system. That may be money well spent if your risk is high. Financial penalties have been levied against companies not for any malfeasance, but simply for failing to comply with legal discovery or record-keeping requirements. Clearly, the costs of archiving would be more than offset in this situation. Remember, however, that an e-mail archiving solution is not a substitute for a traditional e-mail backup and recovery solution. You still need the latter for e-mail reliability and availability. But the two can work hand in hand. E-mail archiving solutions feature additional benefits such as mailbox management, e-mail administration, and mail policy monitoring. Archiving can also help ease the burden on mail administrators, lowering overall costs by moving mail off of primary storage, pulling PST (Personal Storage Table) files off client systems, monitoring mail in real time for policy violations, and more. Today's email threats are far more dangerous than yesterday's. On the inbound side, blended email and web attacks masterminded by profit-seeking criminals are now the norm. Spam is no longer about selling, it's about stealing. Attacks are targeted and fast moving. The perpetrators are more sinister, organized, and sophisticated. Orchestrated botnet armies strike globally and quickly go dormant. Harmful payloads morph continuously to evade signature-based defenses, and are more often delivered through an embedded web link rather than a direct file attachment. Every malicious email that penetrates the perimeter carries dramatically more risk than ever before. 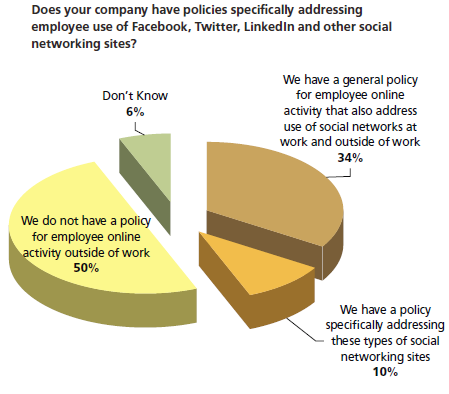 Over 50% of all companies do not have policies for the appropriate use of the Internet. The problem now is that when you Twitter or post to a blog information that might be sensitive thousands of people can see it immediately, and then thousands more could see it as it's forwarded on to others. The ramifications of making a mistake, of putting things that shouldn't be on there on those sites, are even greater than they used to be. The WORD template uses the latest CSS style sheet and can easily be modified to conform to the style used in your enterprise policy manual. Included are two complete job descriptions in MS Word format -- Manager Outsourcing and Manager Vendor Management as well as two electronic forms -- Outsourcing Security Compliance Agreement and Outsourcing / Cloud Security Compliance Agreement. There are many common myths about tape, disk, data protection and archiving, one, for example, being that archiving and long-term data retention are only for regulatory compliance purposes. 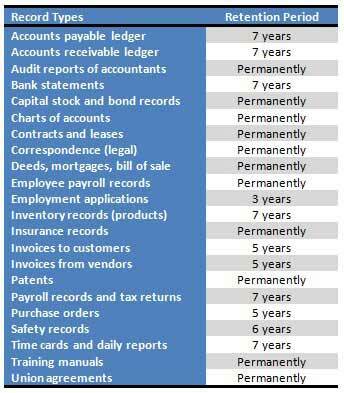 The reality is that while regulatory compliance data, including Sarbanes-Oxley, ISO, financial or HIPAA medical, require long-term retention, many other common application data for almost every business, including those that do not fall under regulatory requirements, can benefit from - if not require - long–term data retention. The notion is to think beyond regulatory compliance. In other words, organizations of all sizes need and rely on information, both current and past. A record is essentially any material that contains information about your company's plans, results, policies or performance. In other words, anything about your company that can be represented with words or numbers can be considered a business record - and you are now expected to retain and manage every one of those records, for slementing or altering the policy. Several years or even permanently depending on the nature of the information. The need to manage potentially millions of records each year creates many new challenges for your business, and especially for your IT managers who must come up with rock-solid solutions to securely store and manage all this data. The Record Classification, Management, Retention, and Destruction policy is a detail template which can be utilized on day one to create a records management process. Included with the policy are forms for establishing the record management retention and destruction schedule and a full job description with responsibilities for the Manager Records Administration. Includes HIPAA Audit Program Guide, a PCI Audit Program, and an electronic form that can be used to quickly deploy this Policy. Plus as a bonus you get the User/Customer Bill of Rights for Sensitive and Confidential Information. This policy is easily modified and defines how to treat Credit Card, Social Security, Employee, and Customer Data. The template is 34 pages in length and complies with GDPR, Sarbanes Oxley Section 404, ISO 27000 (17799), and HIPAA. The PCI Audit Program that is included is an additional 50 plus pages in length. Service Level Agreement Policy Template is a nine page policy for a single application, It defines specific SLAs and metrics that are both internally and externally focused. The sample contain over 70 possible metrics presented graphically in PDF format. 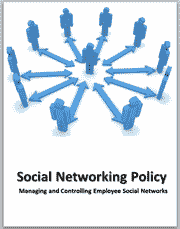 Most employeess will use it wisely and for the benefit of the enterprise - Some CIOs fear that social networking would lead to "Networking" instead of doing their jobs. Employees with proper training and guidance will use this new "technology" in ways that will enhance the enterprise's products ans services. The purpose of the Technology Acquisition policy is to establish guidelines for the acquisition of technology including hardware, software, computer-related components, and services purchased with enterprise funds. Telecommuting is a popular alternative to making the drive in to work every day. 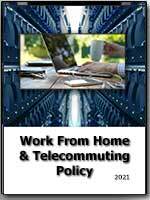 If your users are asking about telecommuting to work, you may find that a telecommuting policy helps makes things clear to them. With the rise of the Internet, and the increase in affordable bandwidth came a new type of worker, the telecommuter. Available technologies, in certain cases, have allowed some companies to offer the ability for certain employees to work from home instead of the office. This can be not only a benefit for the employee, but also for the company itself. As more and more employees clamor for the ability to telecommute, it is imperative for companies to have an in place a viable telecommuting policy. 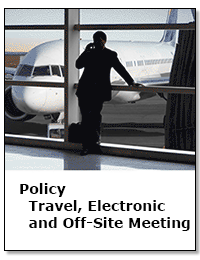 Telecommuting Policy Template - This policy is over 20 pages in length. It contains everything that an enterprise needs to implement a functioning and compliant telecommuting process. Included are forms defining the working environment in addition to a check list to validate that the off site location complies with you safety requirements.